Today, I’m going to talk about holidays. As you may already know, there’s a full calendar system in Village Monsters – every day is different than the one before it, whether it’s shop schedules, weather, seasonal items, and all sorts of other stuff. Of course, a big part – and indeed, perhaps the best parts – of any year are the various events and holidays that pepper the calendar. Village Monsters is no different! There are many events to discover each month, and they can range from as big as major holidays that overall the entire town, to reoccurring events like fishing tournaments, to very local events like villager birthdays, bowling, and Anime Night. Indeed, the calendar is so important that there’s an entire tab in your Compendium that keep tracks of the various happenings around town. You’ll definitely want to check this section periodically so you can keep track of what’s coming up – for instance, you don’t want to show up to the fishing tournament with a crummy rod and amateur fishing skills, right? Each event will bring some new wrinkle to village life – new activities to enjoy, exclusive items to buy and collect, and visitors to talk to. As you can likely guess, many of the holidays and events in game have analogs in the real world, though each one is sure to have its own unique twist. For example, the Good Egg Day – which occurs the end of Early Spring – will seem pretty familiar and, ahem, relevant to certain events going on this weekend. ORIGINAL HOLIDAY, DO NOT STEAL. TM TM TM. Major holidays won’t just introduce new visitors or activities – in some cases, the entire village, background music, and even the UI will get a themed overhaul. Villagers will of course take part in the festivities as well, and even areas outside the village may have some secrets to find during certain special days. That stuff is part of it, of course, but I don’t want it to be the only things you think of when a holiday rolls around. 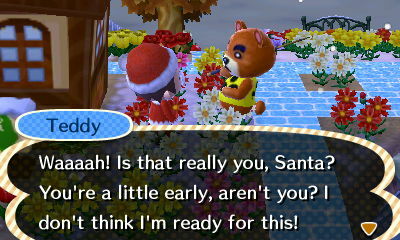 I’m hoping that if I can make it seem like the village itself is genuinely excited about holidays then you, the player, will be too.